A California resident captured footage of an eerie tree as it was beginning to blacken on the outside and fill with glowing, red-hot flames from within. The video was taken by Matthew McDermott of Sonoma, California. He said he and his friend came across the sight Monday while trying to find an escape route as wildfires began to ravage the area where they lived. The two had been driving around the entire night but stopped in the nearby town of Schellville after seeing the tree full of fire. "I've definitely not seen anything like this before," McDermott, who's lived in Northern California for roughly a decade, told CNN. "We wanted to know the escape routes in case we needed them. The route to Paloma was open. I just stopped on the side of the road and the whole ridge is on fire." He said he had to bring masks while checking the roads as smoke from the fire caused air in the Bay Area to turn toxic. Luckily, McDermott confirmed that he and family living in the area have been able to remain safe. 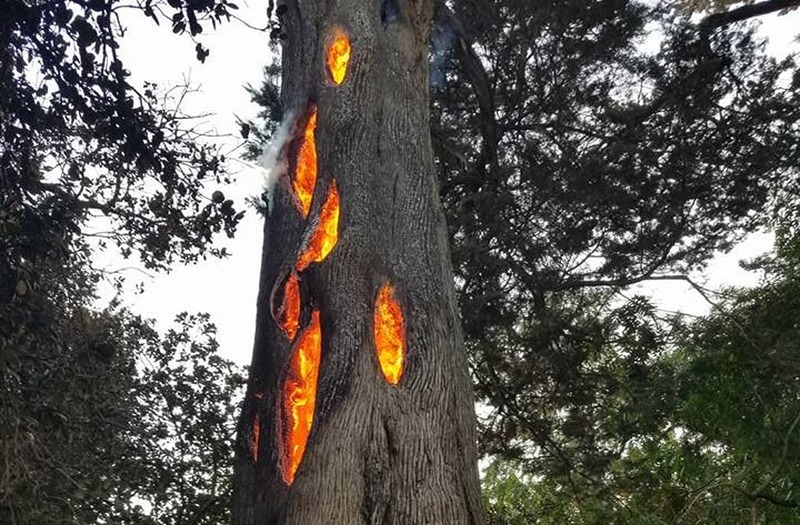 As for the strangely lit tree, however, though it hasn't been investigated as to why the tree burned from inside out, this particular phenomenon has been seen before. According to Science Alert, though fire can spread quickly when conditions are dry, if the outside of a tree is damp -- likely due to rainfall -- fire can start to smolder from inside its hollowed-out trunk, and, in some cases, for days.